It’s a sad scene when you walk into the room only to see your little fish friend floating belly-up at the top of its bowl. Once full of life, your fish now floats creepily at the water’s edge, lifeless and morbid. But why do fish float when they die? He certainly isn’t trying to make it easier for you take out the fish net and lift him out of the tank and into the toilet bowl. So what gives? Fish are only slightly more dense than the water in which they live, sleep, and swim. They are what is called neutrally buoyant, which simply means that the force of the water pushing on above and below them, or up and down, is practically equal. Because of this neutrality, when a fish is alive, it takes little effort for the fish not to float or sink. That is, however, until the fish reaches depths at which pressure increases. In order to maintain such neutral buoyancy, your little friend relies on an internal pouch called a swim bladder, which works to counteract the difference in pressure. When water enters a fish’s mouth, it passes through the gills where oxygen is separated and carried through the blood stream. Some of that oxygen is released into the swim bladder, the amount of oxygen determined by the pressure acting upon the fish. The more oxygen in the swim bladder, the more the fish will float upwards. The less oxygen in the swim bladder, the more the fish sinks. As such, at deeper depths with more pressure, the fish will naturally and unconsciously release enough oxygen into the swim bladder to stay neutral. At shallower depths, the excess oxygen will simply diffuse out of the gills. Oxygen remains in a fish’s swim bladder even after death, but as the body decomposes, additional gases as byproducts begin to fill the swim bladder as well. The bacteria that aid in decomposition of organic matter – in this case your fishy friend – also let off gas. With no active checks and balances to release the unnecessary build up of gases, the swim bladder continues to fill until the neutral buoyancy is disturbed to the point of floating to the water’s surface. As most of a fish’s mass is in the bone and muscle on its dorsal side (back), dead fish tend to float upside down with their gas-filled bellies facing upwards. Sinking to the bottom of the bowl is also a symptom of a fishy passing. 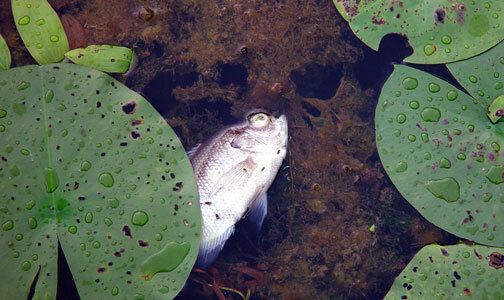 A fish may sink immediately following death, lingering at the bottom until the gases begin to build up. For you fish enthusiasts out there, you may wan t to check out Fish Channel for all things fishy.